Business Process Model and Notation (BPMN) is a standard for business process modeling that provides graphical notation for specifying business processes in a Business Process diagram (BPD), based on traditional flowcharting techniques. The Object Management Group (OMG) develops and maintains the BPMN specification. 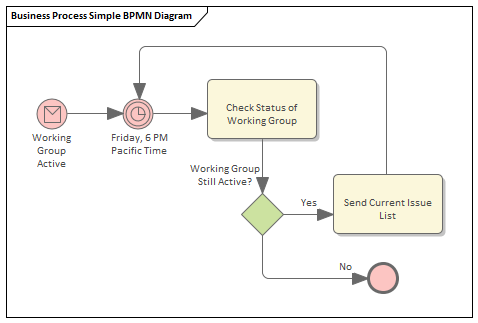 BPMN represents the amalgamation of best practices within the business modeling community to define the notation and semantics of Collaboration diagrams, Process diagrams, and Choreography diagrams. It is intended to be used directly by the stakeholders who design, manage and realize business processes, but at the same time be precise enough to allow BPMN diagrams to be translated into software process components. Business Process Modeling Notation has become the de-facto standard for business process diagrams. It has an easy-to-use flowchart-like notation that is independent of any particular implementation environment. You can access the BPMN Toolbox pages through the 'Design > Diagram > Toolbox : 'Hamburger'' ribbon option, then select BPMN 2.0. You can also set BPMN as the active default technology to access the Diagram Toolbox pages directly.